They were at the Housing Expo as was another distributor with a similar product, though I thought Gigacrete had a better product, though can't remember why now. I'd have to look at my brochures. But, those concrete blocks are so 20th century, so time for improved materials. That, if true, would also be quite a savings over traditional concrete block building. Their model caught my eye as it was going up, because it was clear they weren't using concrete blocks - too white, and indeed looked like Styrofoam reinforced with rebar. Lot of interest at Expo. It is polystyrene with steel studs. Then coated in their stucco/concrete inside and out. No Portland cement. Uses coal ash from power plants. I'm going to look more into it. Supposedly exceeds current code. Forgot wind speed test promise, though. 200? impressive. i wonder if this is what hubby was talking about the other day. It's a GigaCrete GigaHouse, a steel-framed insulated EPS foam (different from styrofoam) panel system. GigaHouse arrives at the build site as a complete kit with pre-engineered parts.. Two low-skill workers using simple tools and a ladder can erect and finish the structure including roof in days--not weeks or months. The assembly is foolproof; no measuring or cuttting. The patented steel frame, bolted to a concrete slab, accomodates precisely engineered 6-8 inch thick EPS (expanded polystryrene) panels that slide into the grooves of specially designed channels on the frame. There are chases for wiring and plumbing. Standard windows and doors fit into pre-measured apertures. In a word, assembly is snap. The secret sauce are the revolutionary rock-hard, non-Portland cementitious plaster coatings for exterior walls and roof (StuccoMax) and interior walls and ceilings.(PlasterMax). There's nothing even close to these high performance coatings on the market. Sprayed or troweled directly onto the interior and exterior these coatings encapsulate the entire structure. One-coat PlasterMax is the world's only fire-rated code-approved plaster coating for EPS foam. PM is enormously strong and durabl;. compressive strength 10,000psi. In contrast, gypsum board drywall compressive strength is rated 125-400psi. StuccoMax 3500psi; ordinary stucco (nonwaterproof and notorious for fracturing) 700-900psi. Neither PM or SM will crack or shrink. Both are waterproof and resist mold, mildew, rot, insects, and vermin. The completed GigaHouse is affordable, immensely strong and durable, and engineered to last. It will withstand hurricanes (up to 200mph) and earthquakes (rated for Zone 4). Looks like a regular house but is in fact more a fortress. Indeed, a slightly thicker coat of PlasterMax on the interior walls renders the structure safe from bullets. The exterior and interior coatings readily accept paint or can be left au naturel. Architectural details using coated EPS is limited only by the imagination, and faux brick, stone, half log etc.--all made of StuccoMax--can become part of the exterior. PS. There's a GigaCrete GigaHouse built on Grand Exuma Island in the Bahamas. What is the average cost per square foot for a structure like this? In 1901, Ransom E. Olds*, founder of the first automobile company in the USA, coined the slogan, "Ask the man who owns one." Olds sold millions of Oldsmobiles with that sage advice.. 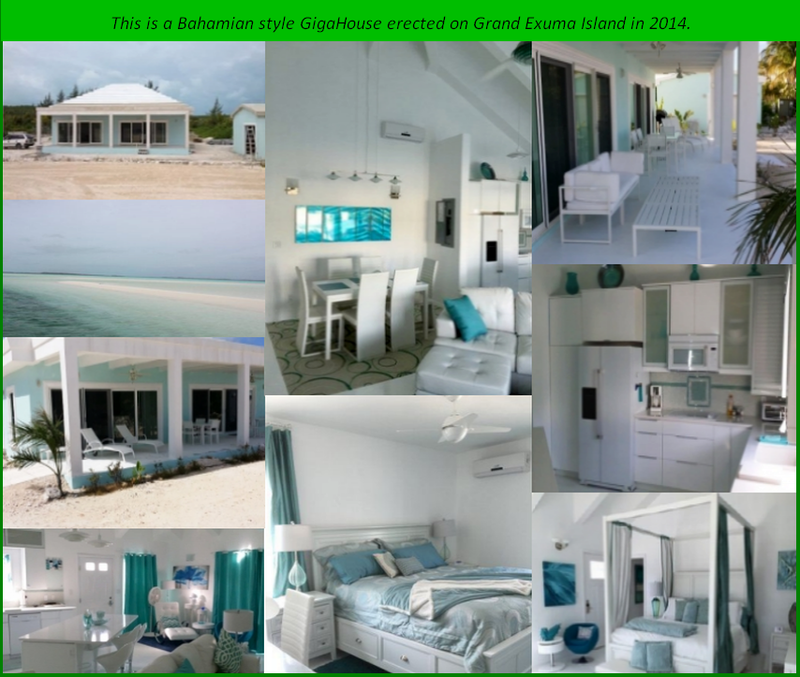 The GigaCrete GigaHouse built on Grand Exuma Island in the Bahamas in 2014 is the first GigaHouse erected in the Caribbean. As the overall conditions there are comparable to the U.S. Virgin Islands, I'd suggest first contacting the owners for their experience. If you search 'GigaCrete' and 'Aqua Dreams', you'll find the pathway and numerous pictures of the house. Until a GigaCrete factory is put up in the USVI (such plans reportedly afoot per May 18, 2015 piece in V. I, Daily News, q.v., 'Company plans St. Thomas factory with cheaper alternative to concrete'), the materials would need be shipped from Las Vegas where GigaCrete, Inc is based. In any case, in addition to the advantage of advanced building materials and methods, there is a significant savings in labor costs vis a vis the usual methods and usual materials. As someone said, concrete block is so yesterday. *The band R.E.O. Speedwagon took its name from R. E. Olds. As a former Packard motor car owner, in the sixties my high school car was a 1936 Packard , I humbly beg to differ with the origin of the phrase "Ask the man who owns one"
I know nothing about gigacrete however and appreciate the testimonial. Hat tip. You're quite right, and given that my uncle owned a 1954 Packard, I should have known better. "Ask the man who owns one" does date (in print) to 1901, but, as you say, it was Packard that used it. In an age of unpaved roads for the sake of horse travel, Ransom E. Olds came up with, "All roads alike to The Oldsmobile" in 1902. Somehow, that slogan lacks the pizzazz of Packard's. Entertaining and educational A/V presentation, created by a group at the University of Massachusetts, comparing Portland cement to GigaCrete. Dated 04 December 2014. The group also included a transcript with bibliography at their presentation site. The harm that comes with using cement in construction. -One of the biggest problems in the construction phase is the use of cement in concrete. -Concrete is a major component in construction, but using it leads to several environmental and health impacts. -With all the physical problems concrete presents, there are far greater environmental and health impacts that need to be assessed in order to be a “green” society. -The cement and concrete industries are the two leading factors of carbon dioxide emissions. -This industry makes up 5% of the world wide man-made emissions that are evaporating into out atmosphere. - “Surface Runoff” is another factor that contributes to the negative impact of cement. It occurs when water slides off of impermeable surfaces, like concrete, and causes flooding and also soil disintegration. - Concrete and Cement contraction also leaves behind large amounts of dust and residue in residential atmospheres. - Simply put, GigaCrete has the ability to act as a substantial substitute for concrete. - By including patented structural steel, and large insulated panels the Gigahouse is able to be constructed in a matter of minutes. - At this advantage, Gigacrete is able to construct a house in a period as short as a day, or even less. -Besides the fact that “All walls are super insulated with higher R values starting at R-24 up to R-60” (Gigacrete), “Gigacrete” offers numerous environmental benefits. - This structure is produced to “withstand hurricane force winds and CA seismic zone 4”, and also is ideally suited for lower cost and affordable housing. Gigacrete uses no wood, doesn't rot, mold or mildew, and is insect and fire resistant. - In addition to all of these benefits, Gigacrete is also exceedingly easy to construct and can be forged by an unskilled laborer. -GigaCrete’s process integrates environmental considerations into product and process engineering procedures, sometimes called design for the environment and is also LEED certified. As the need for more sustainable, eco-freindly construction arises, “Gigacrete” provides an innovative look on how to improve the performance and strength of structures. By introducing high performance coatings and building systems, Gigacrete technology allows contractors and building owners to construct a super insulated, steel framed building system. Now, as environmental problems still surface, it is our job to initiate the use of new revolutionary “green” technology, such as “Gigacrete”, and change the face of sustainable construction. - Gigacrete is moving towards more eco-friendly construction methods, such as the Gigahouse, which is an ingenious way of building high grade, sustainable, homes faster and in a more energy efficient way. - GigaCrete is a innovative modern technology that uses “green” building materials to provide a high performance, sustainable structure. - A steel track is placed as a foundation for a house. Soon after the panels are individually put up adjacent to one another, and fastened together by steel connectors. - “GigaHouse is the Fastest to construct and Most Energy Efficient Home Today”. Alter, Lloyd. "Gigacrete: An Alternative to Concrete." TreeHugger. N.p., 4 June 2007. Web. 03 Dec. 2014. "GIGACRETE." Newyorkpolysteel. N.p., n.d. Web. 03 Dec. 2014. "GigaCrete." NUDURA Insulated Concrete Form Distributor. N.p., n.d. Web. 03 Dec. 2014. "New Building Materials: Gigacrete." Gigacrete Manufactures Lightweight Concrete That's Green Building and Sculptural Material. N.p., n.d. Web. 03 Dec. 2014. "NextGen Home Experience®." NextGen Home Experience®. N.p., n.d. Web. 03 Dec. 2014. "Products." Gigacretecom. N.p., n.d. Web. 03 Dec. 2014. "Technology." Gigacretecom. N.p., n.d. Web. 03 Dec. 2014. "U.S. Green Building Council." U.S. Green Building Council. N.p., n.d. Web. 03 Dec. 2014. "What We Do." Gigacretecom. N.p., n.d. Web. 03 Dec. 2014. Interesting wrinkle. "GigaHouse by GigaCrete" specified by US for employee housing in Kaibab National Forest in Arizona (~1.6 million acres bordering Grand Canyon, north and south). FYI Here's a flying bird's eyeview of a completed GigaHouse on a Bahamian beachfront wiith complementary GigaHouse garage both anchored securely to concrete slabs. Both built without resorting to the use of concrete blocks, rebar, Portland cement, bricks, stone, wood, wood products, or drywall, They call it Aqua Dreams notwithstanding both structures are waterproof and will withstand 200MPH hurricanes and CA Zone 4 earthquakes. gigahound - presume you work for the company which has now established itself in the VI? I visited the factory in Las Vegas and left wanting to build with their system. I own land on STT and will visit the house they built in STT in October. Not crazy about the roof in the YouTube video. Why did they build it like that? For more surface area? It'll be a pain to pressure wash.
Too bad they didn't have any interior shots. GigaRoof, of numerous designs, is rated at 200mph. It would be interesting to know if the "stepped roof" enhances the rating. Historically, the stepped roof design for Caribbean homes dates back centuries. This type roof is quite common in Bermuda and the Bahamas where its form has developed from function: 1) to collect more rainwater through a succession of inclined gutters and 2) to strengthen the roof against hurricane force winds. Built in 1640, the Carter house, one of the oldest standing homes in Bermuda, still has its original limestone stepped roof despite countless hurricanes roaring across the island over a span of nearly four hundred years. Our roof has that design with the step downs. Bahama Hip Roof. Creates "turbulence" so your roof doesn't act as a wing and get pealed off. Not hard to clean, just work one section at a time. I'm guessing that it'd be pretty hard to put one of these homes together with any wind at all... those large styrofoam panels would be really unwieldy "sails". And, if you tried, I'm guessing the panel edges could get beat to pieces. Still, it's an interesting idea. I don't quite understand how the conduit bends around the corner pieces. And, where does the plumbing go? Can you make access panels in the walls, such that after the gigacrete spray you can still get into the walls (at select locations). In other words, how do you repair potential electrical and/or plumbing problems? The panels are not made of flimsy Styrofoam. These are rigid building panels of expanded polystyrene, and assembly is certainly feasible given island conditions. A beachfront GigaHouse and its companion garage were erected on Grand Exuma using the system. The coatings can either be sprayed or troweled on the surfaces. The exterior GigaCrete StuccoMax is mixed and applied like ordinary stucco. There are conduits for electrical wiring and chases for plumbing. Altogether, it's well thought out and adaptable and has lately been specified for forest ranger housing by the US govt. I recommend this website for the details.